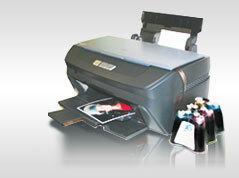 Installation of INKSYSTEM CISS usually takes 10 - 20 minutes and does not require any irreversible changes to the printer. In general, installation consists of the following: original cartridges are removed from the printer, instead new cartridges are installed, connected to CISS by ink tube, ink tube is connected by clips. Period of CISS maintenance is practically unlimited and measured in hundreds of thousands of prints. Usually printer cost when using CISS decreases by 70-100 times. Installation and operation of CISS with qualitative ink increases printer, all-in-one or plotter lives. Once having installed CISS, you do not need to remove CISS from the printer any more and therefore the print head will not contact with air, which will enable your printing station to serve much longer, than with original cartridges. See a presentation video on CISS installation and operation in "Video"
To download instructions on Continuous Ink Supply System (CISS) installation or Refillable Cartridges (RC), visit "Instructions".